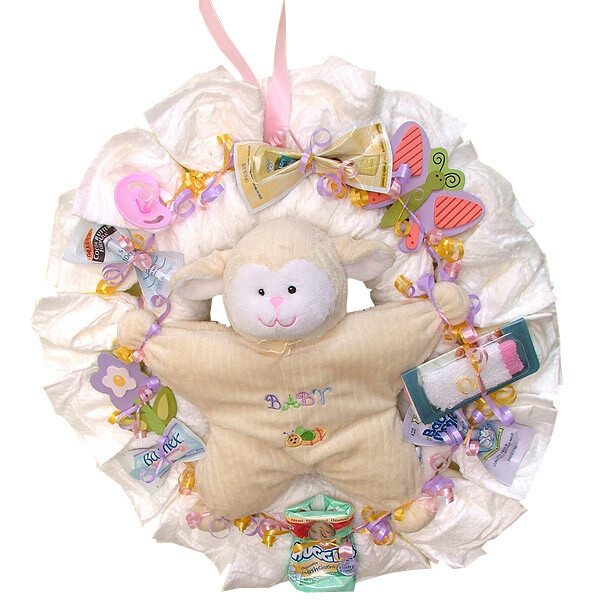 Diaper wreath includes 17 Pampers Swaddlers diapers size 1 (8-14 lb.) 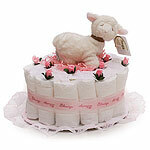 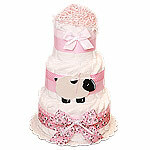 and a soft little lamb for the little one. 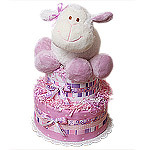 Baby items: wooden flower; Huggies Baby Lotion (Shea Butter) 0.25 FL OZ (7 ml); wooden butterfly; Pink Pacifier; Balmex with Aloe & Vitamin E (5 grams); Huggies washcloth Disposable; Palmer's Cocoa Butter Formula with Vitamin E 0.08 FL OZ; Playtex Baby Magic Calming Milk bath 0.25 FL OZ; Tenders infant Pre-Toothbrushes (trial size); Lavender, Yellow and Pink Curly ribbons.